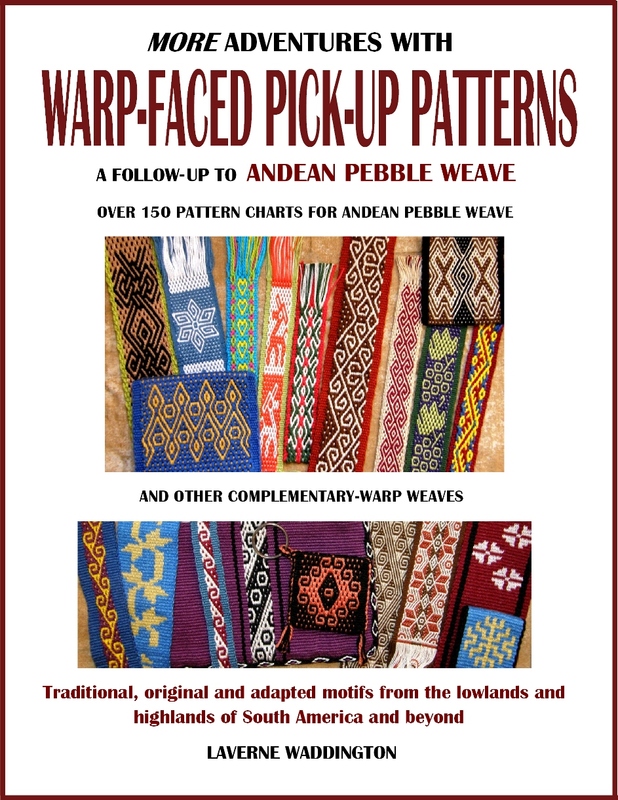 We have been weaving Andean Pebble weave, supplementary-weft, double weave and complementary-warp pick-up structures. The results have been wonderful and I have been particularly pleased with the designs that the double-weave band-weavers have been creating themselves, from Star Trek symbols to patterns inspired by Turkomen rug motifs. And, there is still some patterned tubular band weaving to be done along with sewn embellishments. We made a new weaver. Bethany wove her very first piece ever…a plain-weave warp-faced band…. And now she is already into double weave pick-up following pattern charts. She has found a comfortable way to set up at home. Tracy also got very comfortable with the technique very quickly and was soon adding her own original patterns to the collection of pattern charts with which we were working. I love how people react when they see how effortlessly and automatically the lower layer of the double weave appears. It really is a little piece of magic! I know that Tracy will come up with awesome patterns and color combinations in supplementary weft too. That’s what she is working on below and her pattern ideas come from the various places she has lived around the world and the various textile cultures in which she has moved. I will tell you more about that in my next blog post. Now Tracy knows two techniques that I like to call ”doodling on plain weave”: double weave and supplementary-weft patterning. There are almost no rules and the pattern charts for one technique can also be used for the other. Tracy used the handwoven cloth I brought from Bolivia last year and her tubular edging skills to construct this great cylindrical bag with its drawstring lining. The top and bottom is edged with a ñawi awapa tubular band. So, these have been the just some of the colorful results of the face-to-face interactions I have had with my backstrap weaving friends in my recent travels. There’s been lots of color to brighten up the lingering wintry days. I got dressed in a splash of color while looking over the awesome ikat robes that my friend Marilyn brought back from her trip to Uzbekistan last year. The one I picked to try on is in one of my favorite combinations of color, as you will know if you have been following my blog. She has prepared a presentation of images and video in which she has documented the entire ikat process and we had time to watch it together. If your guild is interested in seeing this as part of a program, I can put you in touch with her. Apart from all this face-to-face interaction and time spent sitting by and backstrap weaving with friends, there has been lost of online interaction and long-distance trouble-shooting and guidance as new weaving friends all over the world take an interest in the wonderful backstrap loom. There is always a certain amount of frustration knowing that if I could only be by someone’s side I could set them along the right path in moments. This usually comes from not being able to communicate in writing how a certain part of the process should feel…how much tension should be applied to warp, how hard should the beat be, how does one ”be the loom”. I want to somehow be able to dive through the computer screen but it is amazing what can be achieved with the right amount of tenacity! I made my video class on Operating the Backstrap Loom to help communicate those concepts to those with whom I don’t have the chance to weave side by side. I want to help people understand how it feels to be part of the loom itself. The video class is not quite like having me by your side but so many people have commented that it is pretty darn close and that pleases me no end! I got to visit the home of my video class, Taproot Video, on this trip. It was fun seeing both my and John Mullarkey’s dvds going out to a customer in the one package. John Mullarkey is the latest instructor to join the Taproot Video co-op and his tablet-weaving class is on Egyptian Diagonals. These and all the Taproot Video classes are also available for lifetime streaming. Tracy and I went along to see an exhibit of the private collection of Leslie Grace in Seattle. It included this fabulous example of the woven and twined cuffs made on simple looms by the Mayoruna people of tropical lowland Peru. Check out the two sweet dangling shuttles. Some months ago, I posted on this blog about the way the weavers close the cuffs by threading the braids through the header cord. Jan had brought this to our attention and used the technique to finish her cuffs. She is even using the dangling braids as a wrist distaff for her spinning. The Mayoruna cuffs have subtle patterning in relief. If you look closely you will see a diamond pattern. 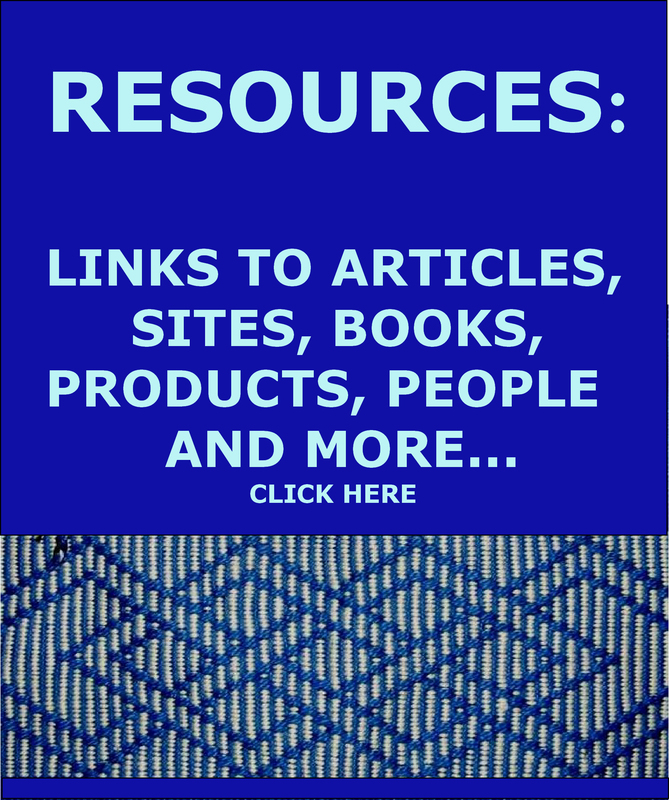 Certain warp threads are twined while others are not. The twined threads stand out in relief against the others. I had tried this some years ago using twine for the warp threads as I had wanted to weave border panels to accompany my Shipibo-inspired wall hanging. I chose twine because I thought that it might resemble the kind of fiber used by the Mayoruna people. I thought that using a lowland technique would be very suitable. However, the pattern simply didn’t show up enough in the twine. I think that something even stiffer is needed to make it work and I didn’t want stiff panels for my hanging. That’s my sample in red twine above closest to the black-and-white panel. You can see the red-on-red cotton warp-float technique I decided to go with instead on its right. You can see pattern in my twine sample but it wasn’t showing up as well as I had hoped. (Actually, now I am looking at this picture and wondering why I had rejected that band. The pattern seems to be very clear to me now!) In any case, it gave me the opportunity to explore the technique and understand better what was going on. Next to my cotton panel is a lovely white-on-white Mexican example of a simple warp-float pattern. Here’s the finished cuff from Leslie Grace’s collection. Of course, there are plenty more things to show you from that collection. My adventures with dear Tracy in Seattle at this exhibit and in her home in magical Port Townsend will be coming in another blog post as well as pictures of some of the amazing textiles and bands that Marilyn brought back from Uzbekistan. Here are some sweet wooden ends for woven bracelets that come in four different kinds of wood. I have already ordered some maple and walnut ones and look forward to using them with my bands. I do have, after all, a whole bunch of woven sample bands from my last two books that can be made into bracelets or cuffs. Indigomargo made another cuff since I last wrote a blog post…I love seeing this pattern which is one of the ones I created myself for my first book way back in 2010. And speaking of those books, I have been receiving the sweetest feedback of all…pictures of things people are weaving using the patterns and techniques! My friend Emerald in Australia wove this belt using a backstrap loom. There’s probably a pattern from each of the four books in this piece. The viscacha is in the latest book. These ones come from Alexandra (top left), Maxine, Nancy and Maxine again who has just started on the various ”River and Ocean”-themed motifs. All three weavers are using inkle looms. The complementary-warp pick-up technique is well suited to inkle looms and any other kind of loom that can give you two sheds and allow you to weave warp-faced fabric. 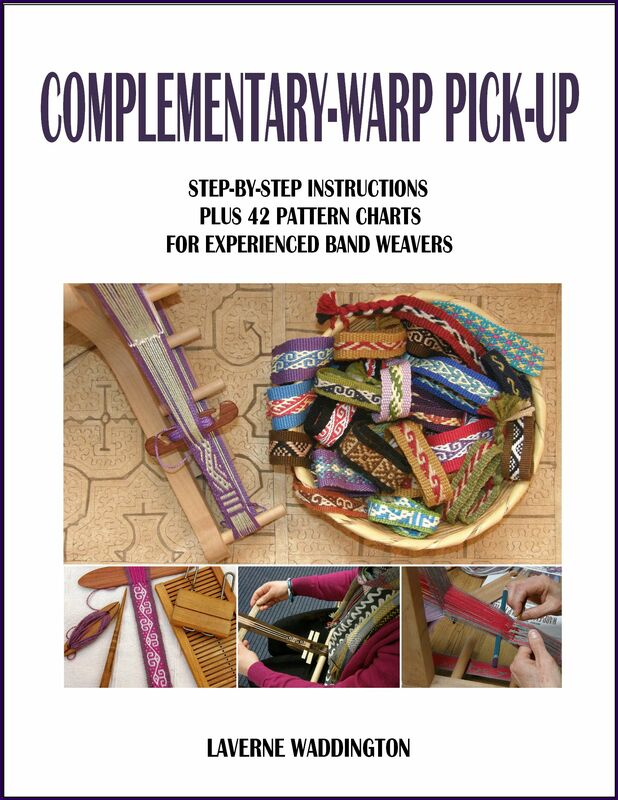 My third book teaches the technique and provides 42 patterns for band weavers. The fourth book has an additional 100 patterns using the technique for bands and beyond. I will leave you here. I simply must. I’ll be weaving double weave tomorrow with friends old and new and I have been experimenting with a new way of arranging the edge threads and need to get my head straight on that. Of course, I have learned a couple of different ways of handling the edges from my indigenous teachers and I am using a bit of this and that to create something a little bit different. But, I must show you something that just arrived in my inbox as I was writing this post. Dorinda sent me pictures of Maribel’s very first faja. I have written about Maribel quite a few times. I met her last January when I went up to the highlands to meet with the weavers in Huancarani. She was 19 years old at the time and she was alone waiting for us in the football field with her toddler Daniel when we drove up…waiting patiently long before any of the other ladies arrived. She was keen and determined to be a weaver, join the co-op and produce things to supplement her family’s income. She was the first in the group to ask to learn the new pattern I had brought to show and she fast became my favorite. 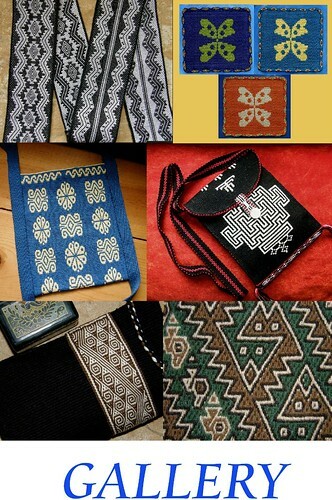 Since then, she has produced some of the bands that get made into yoga mat straps using the pattern I taught her as well as the traditional patterns of her community. Her husband has been really supportive and sometimes helps her wind the warps. Here’s the first yoga mat strap she made with the pattern I taught her. It has its little swing tag with her name on it. I imagine she was very proud of it. However, it is a slower pattern to weave because threads need to be picked up by hand in every single shed. The traditional patterns of the area are in a technique that can be partly loom controlled and, therefore, just that little bit faster to weave. I adore this picture of her proudly showing her first faja with a variety of local patterns! What a way to end a post that began with the awesome yet somber and snowy Mt Rainier :-)… with color and a warm smile! Hi Carol. 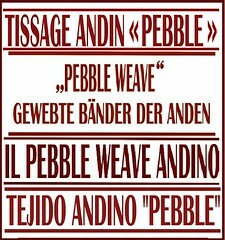 Thanks so much for our comments and I am happy to hear how much you are enjoying pebble weave. I’ll email you so that perhaps you can share photos that way. I’m so glad we got you over to PT!! The double weave and supplementary weft double header was a good idea – they’ve stimulated me to explore more designing, especially since I can use the same charts for both techniques! So cool. What a very rich life you lead. I’m sure you never imagined that you would weave so many people into your life by virtue of your craft. You are right….I never imagined it and am grateful every day for it. Thanks for your comment!